University of Puget Sound is an independent predominantly residential undergraduate liberal arts college with selected graduate programs building effectively on a liberal arts foundation. The university, as a community of learning, maintains a strong commitment to teaching excellence, scholarly engagement, and fruitful student-faculty interaction. The mission of the university is to develop in its students capacities for critical analysis, aesthetic appreciation, sound judgment, and apt expression that will sustain a lifetime of intellectual curiosity, active inquiry, and reasoned independence. 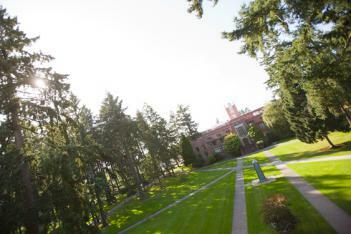 A Puget Sound education, both academic and cocurricular, encourages a rich knowledge of self and others; an appreciation of commonality and difference; the full, open, and civil discussion of ideas; thoughtful moral discourse; and the integration of learning, preparing the university's graduates to meet the highest tests of democratic citizenship. Such an education seeks to liberate each person's fullest intellectual and human potential to assist in the unfolding of creative and useful lives. We believe in the transformational power of a liberal arts education, where students come first and learning and holistic development is an absolute priority. We are committed to articulate and creative self-expression as a means to achieving personal independence and making a difference in the world. We genuinely respect each other and collaborate with honesty, integrity, and openness for the common good. We practice civil discourse and deliberation, and have the courage to address difficult questions with innovative thinking. We are passionate about our work and seek to instill in our students a commitment to intellectual curiosity and productive lives. We seek diversity of identity, thought, perspective, and background in our students, faculty, and staff. We prepare our students to be thoughtful and active citizens and leaders, and support opportunities for the professional development of our faculty and staff. We are responsible stewards of our talents, resources, and traditions. The university and the wider community sustain each other. We value our Northwest location and the unique confluence of urban, cultural, and natural attributes that enrich our learning community. Compiled from key values articulated by trustees, faculty, staff, and other university constituents.